With Ameer's Raam, Jiiva (formerly spelt as Jeeva), son of producer R B Choudhary arrived on the Tamil film scene with a bang. Director Ram's Katrathu Thamizh catapulted him to a higher league as an actor. Unlike the other actors of his age, he chose diverse roles though of late he has been doing the so-called 'mass films' like SMS and Singam Puli. This week releases one of the biggest films of this year and his career, K V Anand's Ko. 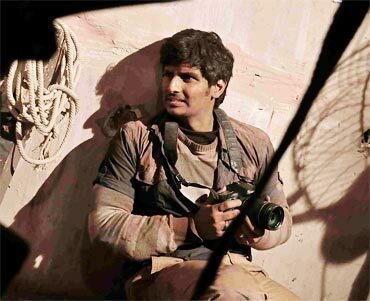 Jiiva plays a photo journalist in the film. Also starring with him are Karthika, Pia Bajpai and Ajmal Amir. Jiiva talks to Shobha Warrier about Ko. When you were offered Ko, did you ask K V Anand why he chose you after Silambarasan walked out? I had initially decided to say no to the film and went to meet the director with that frame of mind. But the script won me over and I agreed to become a part of it. I didn't look at Ko as a film where I replaced Silambarasan. It was a great script and I loved it. How was the first day of shoot? It was very good. The first schedule was to take place in China but I didn't get the visa on time. So we shot in Chennai itself. Yes, we travelled to many places in the world and also shot all over Tamil Nadu. When I interviewed K V Anand, he said instead of a gun and a sickle, he gave his hero a camera as the weapon. It is true. The only difference was that the weapon was used in a very positive way. Normally I get bored after my shots are over but while shooting for Ko, I never got bored because I am playing a photojournalist and always had a camera with me all the time. What was the camera you had? Cannon 7D. I took a lot of pictures and I posted all of them on the social networking sites. I got a lot of appreciation from everyone. Did K V Anand praise you? He never praises anyone. Even after he says 'cut', he doesn't comment on the shot. So you get a bit confused whether it was good or bad. On the other hand, when we were shooting for the Tamil version of Three Idiots, Shankar was quite vocal about his opinion. He appreciates all the actors by saying, superb, very nice, etc if he likes a shot. K V Anand is different. He is so preoccupied about the whole thing that he doesn't make any comments on how we did it. But after the schedule got over, out of the blue, I got a call from him appreciating my work. Sometimes, he overloads you with appreciation. What surprised me was, when we were doing some promotional activities together, he praised me a lot, to the point of embarrassing me. As an actor, do you look for appreciation from your director while shooting? I have worked so far only with new directors. Even if I did a good job, they used to take a 'safety shot'. That confuses the actor about how he has performed. But KV Sir is an established director and cinematographer who has shot with the likes of Amitabh Bachchan, Akshay Kumar and Shah Rukh Khan. He is a very experienced and confident director unlike the first time directors I have worked so far. So, when you get a word of appreciation from such a person, you become more confident. It is very encouraging. To portray the photojournalist in Ko, did you observe anyone or did you just follow the director? After the director narrated the script he told me how to handle the camera, how a professional photographer clicks pictures, etc. He taught me the body language of a photojournalist. As I am a gadget freak, I loved carrying the camera and clicking pictures. It came naturally to me. He didn't make any major corrections in my performance, even in the first two days. Luckily, I grasp things fast. How much did you enjoy portraying a photojournalist? It is a beautiful character. One thing I really enjoyed was, I could wear modern and trendy dresses. Till now, I had been doing these 'poor local' characters that I had to darken my skin and wear very ordinary clothes. For the first time, I was portraying an urban educated guy. I also had a nice hair cut. For the first time in my career I had some English dialogues in a movie. Everything was new and exciting for me. It was fun to portray a stylish guy who was my age, for a change. Was it easy portraying a photojournalist? I won't say it was easy but it wasn't tough too. It was a very interesting role. The character had to deal with a lot of emotions and was a responsible guy. I had not done a character like this before. I would say this is one of my favourite characters. Do you think Ko will be as successful as K.V.Anand's last film, Ayan? It will be a better film than Ayan. I feel it will be more successful. I am very confident about it.